Bookmans has a fun and easy way to get your little ones excited for St. Patrick’s Day. This sweet St. Patrick’s Day craft for young children of a rainbow and pot of gold crown is suitable for primary aged children and younger. Once your crafter finishes, we suggest you read stories about St. Patrick and how and why we celebrate the holiday. For inspiration, Bookmans Speedway’s Story Time Table features titles to educate and entertain your children on the wonders of the Irish and the story of St. Patrick. * Glue sticks, crayons and markers. ** Optional materials include pattern scissors, stickers and glitter. Step 1 — Glue two strips of green construction paper end to end to make one long strip that will wrap around the child’s head. Step 2 — Glue the remaining ends together to make a circle (crown). Step 3 — Color the white strip with crayon or marker to make a rainbow. The official rainbow pattern dictates horizontal stripes in red, orange, yellow, green, blue and purple, in that order. But who cares about order? There is no wrong way to make a rainbow. Let your crafter exercise creative license! Step 4 — Glue the rainbow strip to the inside of the green circle/crown. We glued one end of the rainbow strip to each of the connection points where we made our circle, but it doesn’t matter which direction the rainbow goes. The rainbow should bow over their heads like a bridge. Step 5 — Cut out a black pot from the black construction paper and some gold from the yellow construction paper. Glue those together and glue the pot of gold to the green crown. Bonus Ideas — More skilled crafters can use pattern scissors to cut the green and white strips, just remember to cut before beginning construction. Kids can also personalize their crowns with stickers and/or glitter. The beauty of this craft is that it can be as easy or complicated as your artists wish to make it. You might try making this craft using other materials like poster board, foam or starched fabric. The results are surprisingly adorable. Have fun and enjoy the luck of the Irish on this St. Patrick’s Day! 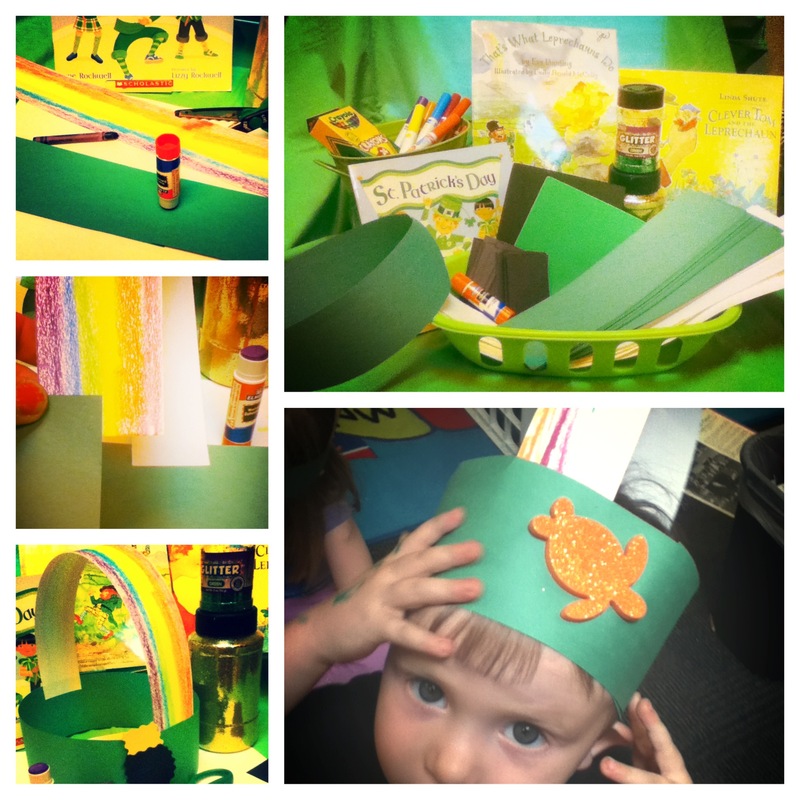 For more pictures of this craft just go to our St. Patrick’s Day Story Time page on Flickr.